As of Jan. 12, single-use bags at Tulane campus dining and bookstore locations cost an extra 15 cents. The Undergraduate Student Government, in collaboration with the Office of Sustainability and other campus partners, worked to create the initiative as a part of a larger conversation about campus waste reduction. The process started last year when Tulane student Kyu Min Huh started a petition to eliminate plastic bags from campus. The change.org page received more than 7,500 signatures. USG Director of Sustainability John Alexander said it was at this point he knew action was needed. The sustainability committee quickly drafted legislation focused on plastic bag usage. After the legislation passed, USG started working with the Office of Sustainability and campus partners to determine what the policy would actually look like. “What’s been seen around the country is that if you have a plastic bag ban, you’re not having a net waste reduction, you’re just having a net waste switch to paper bags,” Alexander said. Representatives of the campus partner Barnes and Nobles suggested a fee for single-use bags, rather than a ban. Since the fee has been pushed out, Alexander and other partners have been working on getting the word out through posters, screens and emails. Every semester, the bookstore orders approximately 40,000 bags. In order to evaluate the impact of the new fee, inventory of the bookstore bag usage will be examined. 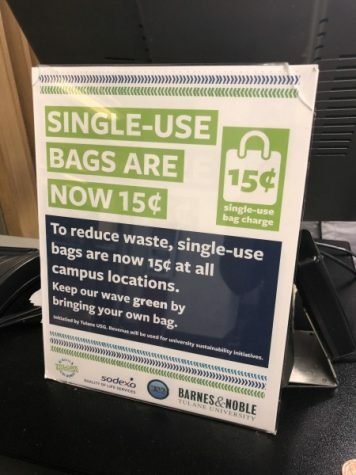 “First is going to be total use of single use bags from Barnes and Nobles, and that will tell us how much reduction in total bag use was there, as well as seeing of the bags that were used and what was the payout to sustainability efforts,” Alexander said. In the meantime, the Office of Sustainability is working on putting together write-ups that outline the cost of projects in order to put the cost of sustainability at Tulane into quantifiable numbers. The project has received positive feedback from all corners of campus. Alexander said the initiative even got positive praise in the the parents’ Facebook group, which he said can sometimes be volatile.